This Grandma loves watching babies watch bubbles. This Grandma loves watching toddlers try to catch bubbles. This Grandma loves when even the older grandchildren love giant bubbles. Bubbles are an inexpensive wonderful visit present that brings giggles and run around fun now that summer is upon us. Oppenheimer Toy Awards on Toy Portfolio, this Grandma’s first go to source, has two recommendations, one of which this Grandma likes. The No Spill Bubble Tumbler is a must for Grandma’s house and a welcome gift for the parents of our grandchildren. Nothing spills out of this container, even when it is upside down, which you can expect with toddlers who want to do everything themselves. You put the wand into the tumbler and it comes out with enough soap solution to make a bubble. The containers come in mini, regular and super sized (with three wands). A great example of a classic toy made even better by an innovative design. There is a Sesame Street two ounce that looks like Big Bird. There even is a big bucket with three large wands for play by more than one child; however, this Grandma has found that young children will fight over the bucket, each wanting to hold the handle. The big bucket is fine for Grandma and a child, as it holds much more fluid. It holds twenty ounces of fluid, that is not included. Buy at Amazon. Oppenheimer recommends this kit with a large bubble wand and concentrated solution, but Grandma does not. This Grandma has found large bubble wands messy, and even Oppenheimer says this kit does not work as well with other solutions. 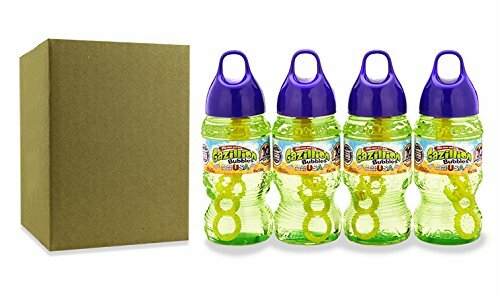 This Grandma has found that the best bubble fluid is Gazillion Bubble Fluid, a sixty seven ounce bottle is about $10, a best seller at Amazon.